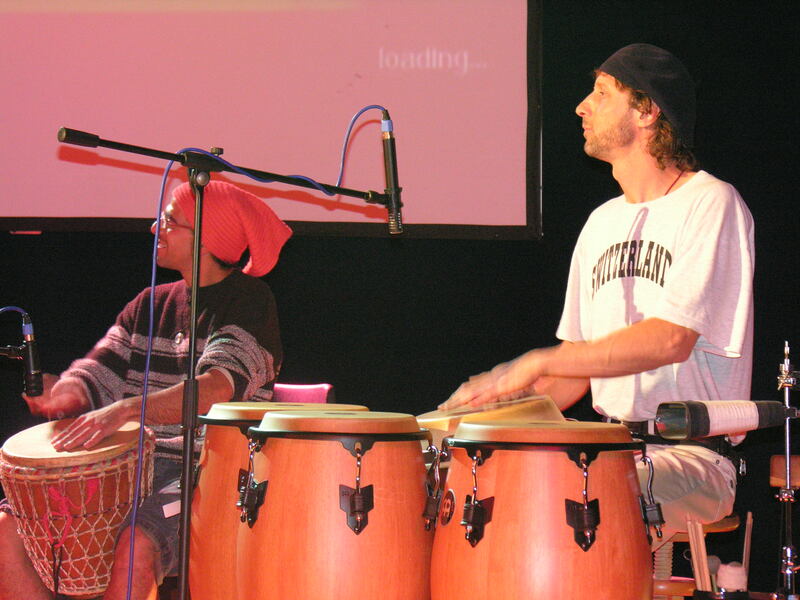 PercussionArts is a school of African, Cuban, Latin and Indian rhythms and percussion. The school is located in the Western Part of the beautyfull City Basel (PercussionArts Wasgenring 78, 4055 Basel). A wide range of courses, workshops and private sessions allow you to immerse yourself in the drumming cultures of Africa, Cuba, Latin-America and India and to develop your skills to the highest level. We provide extensive course materials to give you an in-depth view of the history, theory and practice of these drumming cultures. 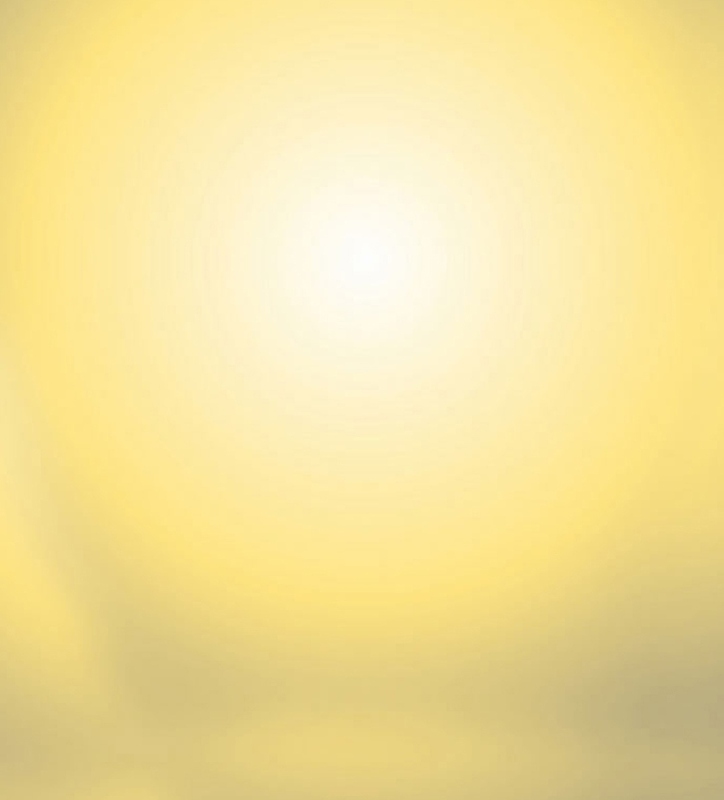 Instruments such as djembés, doundoums, congas, timbales, assorted small percussion instruments, tablas, pakhawaj etc. are available for use during lessons - you can also purchase or rent highest quality African, Latin and lndian drums and percussion-related instruments (visit our 'online shop'). 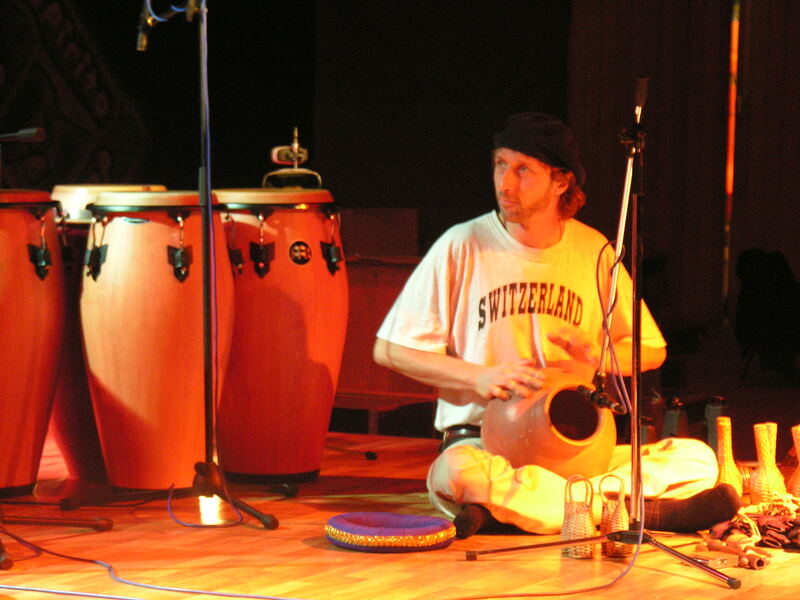 PercussionArts is run by Jörg J. Kaufmann. 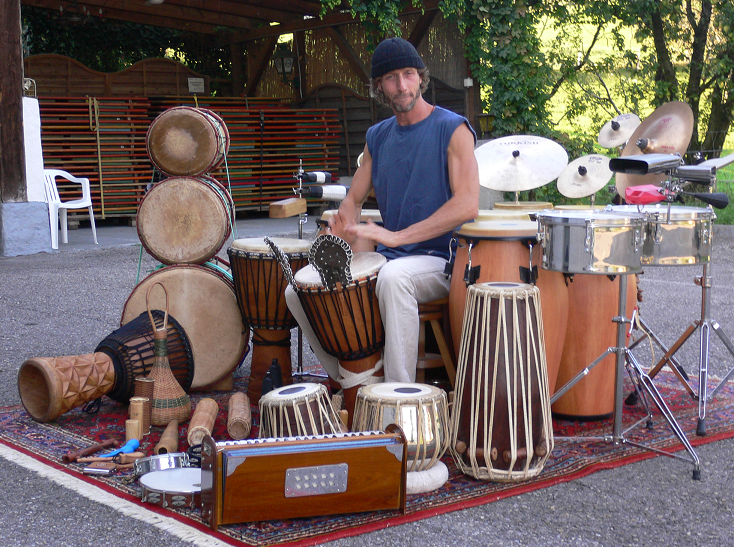 Jörg's interest in non-European drumming cultures was kindled when he was 12-years old. Since then he has studied and researched African, Latin-American and Indian rhythms and percussion with great passion and extraordinary commitment (see his biography below). Geleitet wird PercussionArts von Jörg J. Kaufmann. Im Alter von zwölf Jahren begann er sich für ausser- europäische Trommelkulturen zu interessieren und hat sich seither sehr gründlich mit dem Erlernen und Erforschen afrikanischer, lateinamerikanischer, sowie indischer Rhythmik und Perkussion auseinander gesetzt. With 30 years of experience, Joerg guarantees you a first class learning experience regardless of your ambitions, needs or skill level! 1976-1982 First drumming experiences – lessons and workshops with various Swiss percussionists. 1982-1994 Study of history, theory and practice of conga, timbales and small percussion at the St. Gallen Jazz School (1982-1984) and Zürich Jazz School (1984-1988) with Willy Kotoun. 1985-1996 Djembé, Doundoum (bass drum) and assorted small percussion instruments with African drumming masters such as Adama Dramé, Soungalo Coulibali and Louis César Ewandé, as well as with various Swiss percussionists such as Peo Oertli, Tini Hägler, etc. 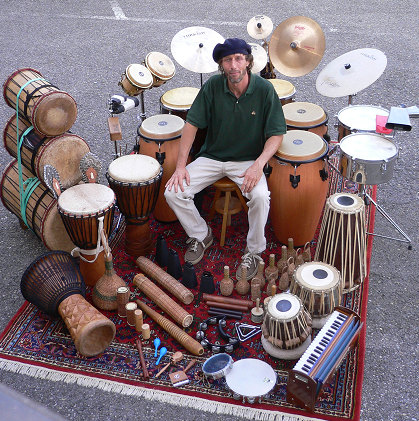 Jörg lived in Northern-India (mainly in Varanasi) for 12 years from 1991-2003 where he researched and studied intensively the barrel-shaped pakhawaj drum (Mridang) considered the "mother" of classic Indian percussion instruments. He focused on a range of different styles that are still being played today (Kudou Singh Gharana, Nana Saheb Pansee Gharana and Nathdura Gharana). He lived and studied with the greatest masters according to the traditional Indian principle of "Guru-Shishya-Pampara". 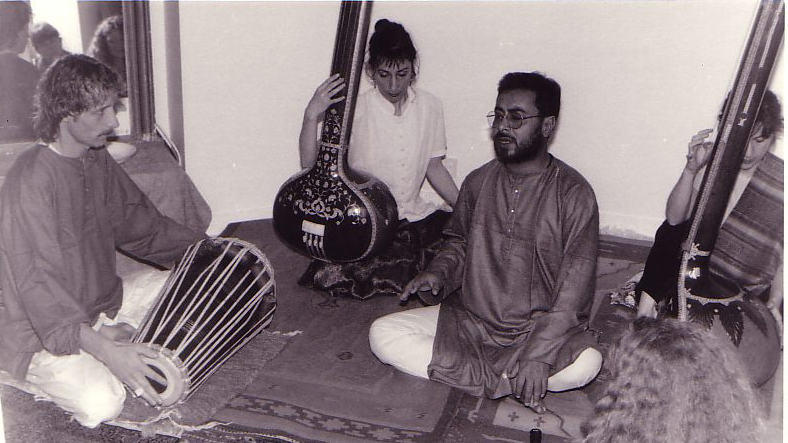 While conducting his research, Jörg Kaufmann came across a range of old books (Tal Manjeri, 1887; Mridang-Tabla Vadanpaddhati, 1903; Mridang Sagar, 1943; Mridang-Tabla Subodh, 1944; Tal-Dipika, 1953; Mridang-Tabla Brabhakar, 1958; Mridang Ank, 1964). The study of this literature allowed him an unparalleled insight into a culture that is difficult for foreigners to access. 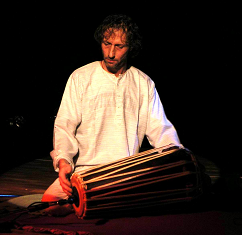 Eventually Jörg achieved such a high level of knowledge and mastery that the Indian Dhrupad and Pakhawaj Society accorded to him the highest level of respect by acknowledging him as a representative of this genre of drumming. Padma Vibhushan Pt. Kishan Maharaj, one of the finest tabla players of our time, hails from an old tradition with extensive knowledge of the pakhawaj - he was impressed by Joerg's playing and research and invited him to his house to expand his knowledge and practice. - Regular professional development in Afro-Cuban and African percussion, as well as Rhythm & Movement. - Plans for future study: annual study and research trips to India to study with the family and disciples of the legendary Pt. 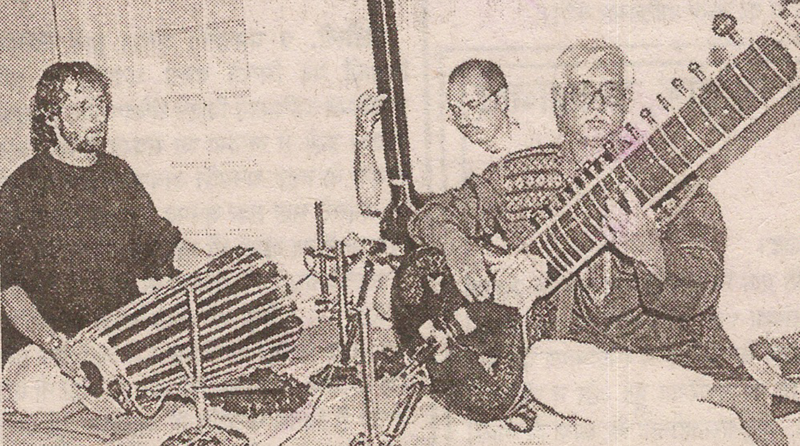 Kishen Maharaj and various pakhawaj masters. - Ausbildungen in Yoga, Yogatherapie und Sanskrit plus Singen`n`Chanten von Mantren, Slokas, Sutras, etc..
- Development of the Research`n`Teaching-Plattform "www.pakhawaj.info" with different master from India. fast`n`easy into a correct practicing, playing and performing ... „YogiPercussionSchool`n`Ashram“.